Magnet activities are set up at separate stations. They can either rotate through them or allowed to explore freely and independently. 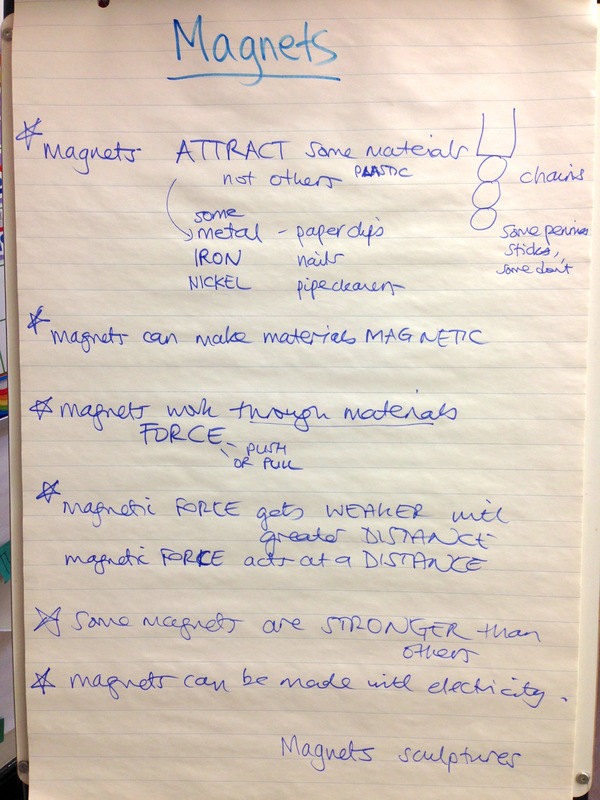 Class discussion follows on what they have discovered, and to distill out some properties of magnets and magnetism. Lay out a selection of activities on separate tables - recommended group of four activities: What sticks to magnets?, Magnetic force through materials, Magnet pendulum and Magnetic force field patterns. For guided experimentation, show students specifically what to do at each station and what they might find. For free experimentation, The Play-Debref-Replay method of science teaching works great for this activity (see the resource). Explain to students that they will be freely exploring at each station, to find out about magnets. No ideas are wrong to try - just be safe and keep the materials at the station. Briefly introduce the students to each station: what materials are there; what themes they will be exploring (e.g. what materials are attracted to magnets at "Magnets: what sticks to them?"). Allow at least 8 minutes per station for students to explore with the materials independently - the teacher does not tell them what to do with the materials, but allows the students to explore independently. ("Play" period defined by Wasserman - see resource). Teacher can opt to have students move to a new station at designated times, or to move when they wish. Ideally, students write down what they discover at each station - they will refer to these notes when reporting back to the class, and for later experimentation; it also encourages good note-taking habits. "Debrief" period: Regroup to hear what the students discovered. 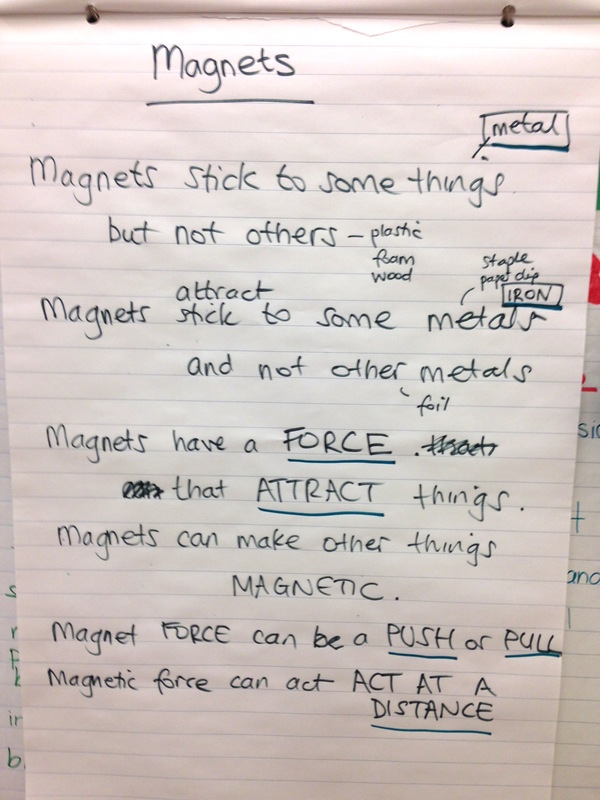 Write up students' discoveries while introducing them to the terminology of forces and magnets. Guide the conversation to allow students to conclude things about magnets. e.g. Students might say that "Different materials "stick" to magnets; write up that magnets have a "force" that pulls things towards them and makes them stick. The materials are "attracted" to the magnet. Ask students about which materials were attracted to magnets, to have them distill out that metals are attracted, but only some metals (those with iron in them). (Some objects may have metal inside them, so confuse the issue, but students will often come up with ideas like this with time). Other concepts to end up at: magnetic force can be a push or a pull, magnetic force can act at a distance, the force field around a magnet is of a varying shape depending on the magnet. One of the debrief points is that magnetic force is a force that acts at a distance. Discuss other forces that act at a distance - gravity and electrostatic force. Blow up balloons and make hair rise up (without the balloon touching it) to demonstrate another force that acts at a distance. 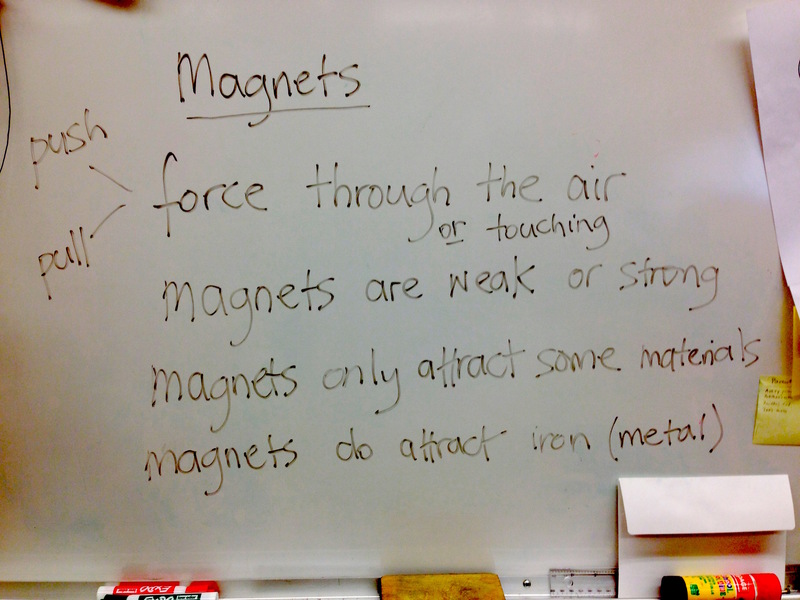 Grade 3 at Carnarvon: what sticks to magnets, magnetic field patterns, magnet pendulum, magnets through materials. Ended with another force at a distance: electrostatic from balloons. Grade 1/2 students with Mari and Monika initially had 6 stations (Magnets: what sticks to them?, Magnets: fishing game, Magnets: paper clip bridge, Magnets: force through different materials, Magnetic field patterns, Magnet pendulum), but then reduced to 5 (Force through different materials deleted). With only an hour available, we will reduce further to 4 (remove Paper clip bridge) to allow time for discussion of results, and summarizing of key magnet and force concepts. Grade 1/2 class with Stephanie at Gordon did these activities: Magnets: what sticks to them?, Magnets: fishing game, Magnets: paper clip bridge, Magnets: force field patterns. Grade 1/2 class with After School Program in New York City did these activities: Magnets: what sticks to them?, Magnets: paper clip bridge, Magnets: fishing game, Magnet strength, Magnet tower sculpture, Magnetic car race. Science Club I tried mixing the materials from different activities, but this was less satisfactory in terms of learning some more defined concepts about magnets and students even got bored a little more quickly. The structured compass activity was added to the end of this lesson.